Conference play came up quick on the Huskers, but they started it off on the right foot, with a win over Michigan State at Haymarket Park in game one of their doubleheader. Senior starter Matt Waldron had an excellent day, putting in a 102 pitch complete game. He sat down all but two of the batters he faced on the day. He mowed through the first six batters of the Michigan State lineup, but surrendered a leadoff homerun in the top of the third to give the Spartans the early advantage, 1-0. With Waldron putting on a showcase, the only thing NU needed was some offense, which was struggling through the first few frames of action. Nebraska missed out on an opportunity to tie the game in the bottom of the third, stranding Mojo Hagge at second base after Aaron Palensky struck out swinging. In the bottom of the sixth, the Huskers finally were able to tie the game up at 1-1. Hagge stole second, setting up Palensky at the plate who promptly ripped one into right center field to drive in the run. That opened up the floodgates for Nebraska. Spartan second baseman Royce Ando committed an error on a routine ground ball that let NU load the bases in the bottom of the seventh. Angelo Altavilla worked a full count on relief pitcher Evan Flohr and drew a walk, allowing Cam Chick to walk 90 feet to home plate to take a 2-1 lead. Nebraska posted two more runs in the inning on a sac fly and an RBI single from Palensky and Keegan Watson, respectively. In the ninth, Waldron trotted back out onto the mound to close the game out. He retired the last three batters with ease, solidifying his complete game, and earning his third win of the season in the Husker’s 4-1 victory. 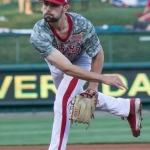 With wins over a pair of top 25 wins Baylor and Texas Tech, Waldron has secured the position as the Husker’s Friday ace, the pitcher who sets the tone for the rest of the weekend. Waldron won’t be getting cocky though. In nine innings pitched, Waldron struck out six batters, allowed two hits, and one earned run. Nebraska is now 9-7 overall and 1-0 in Big 10 play.